Throughout this Catechetical Year I have been visiting Parish Programs during class-times. This allows me to interact with Catechetical Leaders, Catechists and students in many different locales around the Diocese. Though I have only been able to visit about ¼ of our parishes so far I have had some wonderful visits and seen some fantastic things happening in our Religious Ed Programs. The slide show here will highlight some of the Parish Programs I visited and some of the wonderful people I interacted with. All “Workers in the Vineyards” striving to “Belong More Deeply to God, to the Church and to one another”! Working with our fellow Catholic Catechists who work with children from the Malankara Rite, a few of our Catechetical Leaders presented a “Catechists Training Day” at St. Vincent de Paul, Elmont. Some of our Catechetical Leaders presented programs for all Catechists. Let us continue to provide such events for our Catechists and encourage their attendance. A fully engaged group of parents, children, Catechists and parish Catechetical Leaders during a “Communion Retreat” for the Communion Prep students at St Ignatius, Hicksville! At St. Raphael, East Meadow Projects on Saints as well as on the Blessed Mother hang in the hallways for all to see, read and learn about.These interactive ideas help to get all involved in learning about the richness of our faith. Ask Sr. Karen Lademann to share her idea! Worked well in East Meadow. 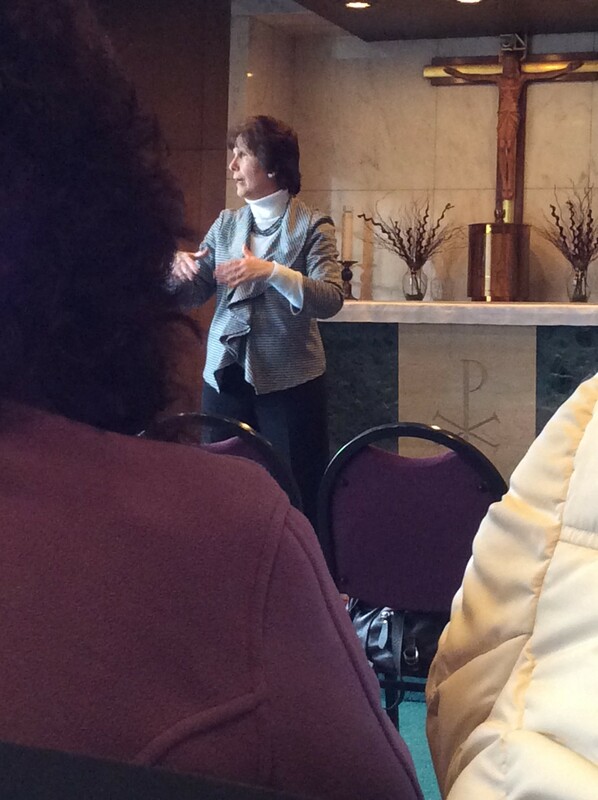 At St Agnes, Rockville Centre, Joann Metzdorff leads the students in the Stations of the Cross. Explaining to them that we take a “journey we walk the way of the cross” to help understand the final journey Jesus made. At St Aidan, Williston Park the creativity of the Catechists was evident in their presentations to their students. Reviewing with a matching game and discussion of the Sacrament of Reconciliation with the use of a cleansing solution. “Our souls are cleansed”! Good analogy for fifth graders. Through the use of “simple props” these two different level two Catechists were letting their students experience the Last Supper and what the altar looks like and what things used for the mass are called. Our Lady of Victory, Floral Park is preparing their children well for receiving their First Communion. Catechists at St. Margaret of Scotland, Selden portray people who saw Jesus. The students and their sponsors followed “the footsteps of Jesus”. It was a wonderful evening. In between sessions at Blessed Sacrament, Valley Stream,these young people lead a session of “Songs and Prayer”! This is enjoyed by all!! Students, Catechists, Parents and Parish Catechetical Team!